Today was the last (Day #7) day of Chocolate + Hearts and Flowers Theme Week, and Day #1 of Chocolate and Islands Theme Week. 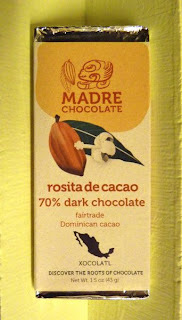 And what a beautiful intersection of these two worlds this 70% dark bar was from Madre Chocolate (Honolulu, HI). The rosita de cacao bar was made with rich, dark, fair trade Dominican cacao, with earthy and floral (rosita de cacao) notes. I could easily imagine being in the middle of a tropical jungle when I took a bite of this bar.